Update on retirement plans: the yellow Cub sold. We are sad to see it go, but it is going to a good home were it will spend its days as a trainer for folks seeking a tail wheel endorsement. A perfect life for this sweet little Cub and one step closer to an RV for us! The photo challenge this week was “kids” – ugh! I don’t have any kids and the only kid I really see very often (my youngest niece) is not close by. I fear that I raised enough suspicions about my character during the suicide grocery photo session last week. What will happen if people catch me stalking their children? I want to retire to the wild west, NOT the state pen. Oh wait, I am supposed to join a different niece and my sister in a Reindeer Romp 5k and since this race serves as the grand finale of the “Go Far” youth program at my niece’s gym there will be lots of children to photograph! Normally, I race just for the exercise because I know that I am too slow to win anything. 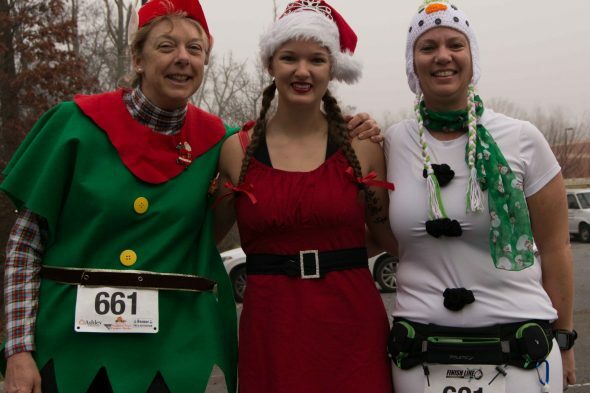 But this is not a race about speed, instead great prizes are available for the most festively dressed runners! 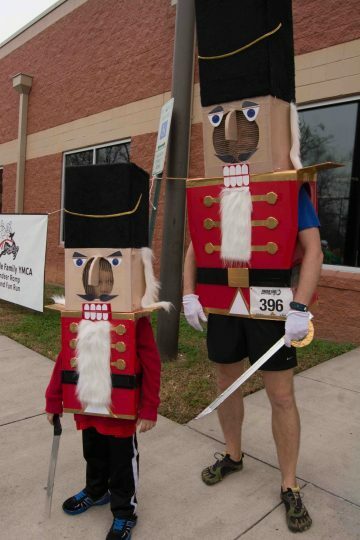 The costume competition is stiff, last year’s winner was a man dressed like a fireplace with a fire, stockings hanging from the mantel, decorations and how do you run in a fireplace costume anyway? Doesn’t that create a lot of drag? This is my chance to win big and I had better make this good. Time to dust off and upgrade my oxymoronic big elf costume. Maybe if I add some magically hand stitched (I don’t own a sewing machine) elf running shoe covers, I will win? Working feverishly Friday, I finished the shoes and spent several whole minutes testing them in the driveway. After a few tweaks, it appeared that I had a set of covers that would possibly last all 3.1 miles. I meet up with my niece and sister at the race. Sure wish the temps were a little cooler just for the race (wouldn’t dare complain about the warm temps otherwise). 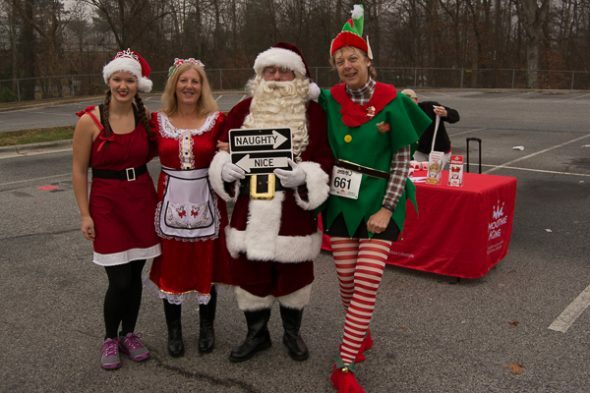 Thank goodness for the fog during the race, I don’t know how elves can work in those outfits! 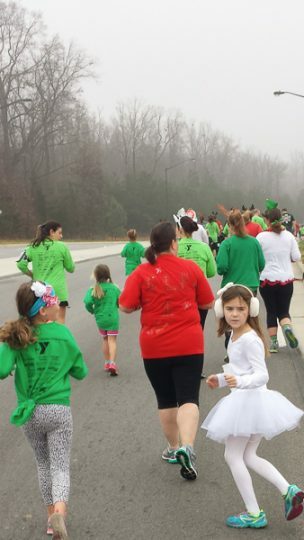 I was soaked after a few feet of running and I feared that my sister the snowman would be completely gone by the end of the race! This cute one didn’t even need the costume to win! This was fireplace man the year before and before that he was a Christmas Tree! 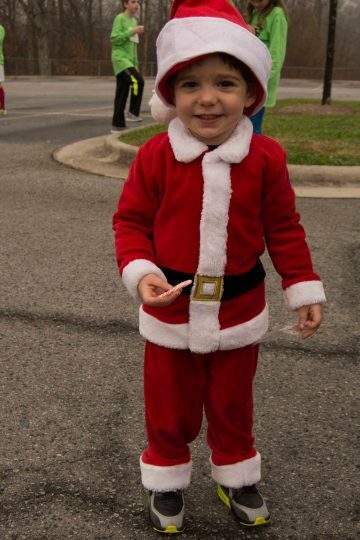 I also learned while racing that during the holiday season Elves can be very inspiring to young racers. 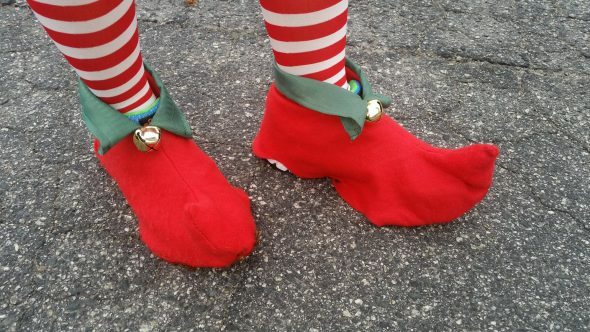 There were several instances where a young racer hearing the jingle jangle of my elfin shoes gaining on them in the fog, glanced nervously back at me, then sped up while screaming something about the giant elf. Oh No it’s the GIANT ELF!!! Well Joshua took off and I never saw him again. Who knows, maybe if I had gotten to him sooner he would have won the entire race! The great news is that I helped a young person realize their racing potential, got my photos of kids AND I won a $50 Sheetz gas gift card for my costume. Now THAT is what I call a worthwhile Reindeer Romp. People who know all the answers haven’t asked the right questions.